Achievement Day study materials consists of study guides (below) and a CHA Manual. Study guides for the Achievement Day Testing has 5 levels: Entry Level, and then Levels 1 - 4. Show grooming reference guide posted on this page. Each level is designed to be mastered in approximately two years. The study guides are used to guide horse project members in their preparation for testing. These study guides cover CHA manual topics, and include supplemental topics such as trailering, wraps, and feeds. Entry Level - No riding. Demonstrations & oral review (no written review). Level 1 study material to be used. Novice Level - Walk only riding pattern. Demonstrations & written review. Level 1 study material to be used. Riding pattern to be posted by March 21st. Level 1 - Walk and Jog or Trot riding pattern. Demonstrations & written review. Level 2 - Must have passed Level 1 in previous year(s). Riding pattern, demonstrations, written review. Level 3 - Must have passed Level 2 in previous year(s). Riding pattern, demonstrations, written review. Level 4 - Must have passed Level 3 in previous year(s). Riding pattern, demonstrations, written review. 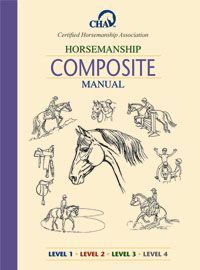 The CHA Manual can be ordered at the link below, or you may contact your leader to order through the Countwide Horse Leaders Group to recieve membership discounts. Updated 2008 Version. This is the manual that the Achievement Day testing is based on. Show outfits or 4-H uniform allowed. *Hats & Scarves are available at various local Feed Supply Stores.